I bake myself a birthday cake every year and this year I wanted something sinfully decadent. 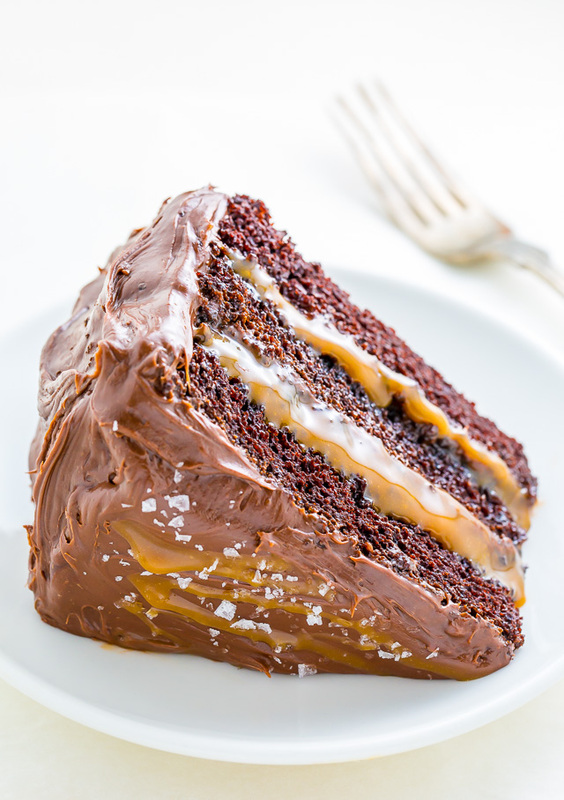 At first I thought it would be chocolate (my favorite)… then I started dreaming of something drenched in salted caramel… finally I decided to full on treat myself and create a cake that featured BOTH. 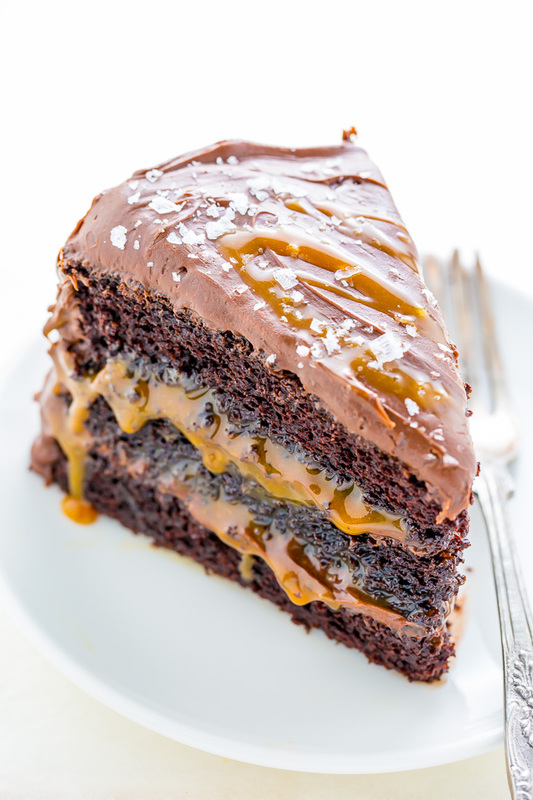 So, without further ado, meet my 29th birthday cake: Salted Caramel Chocolate Cake. This recipe calls for vegetable oil, but you can use an equal amount of melted coconut oil in its place. I do not recommend substituting oil with butter. 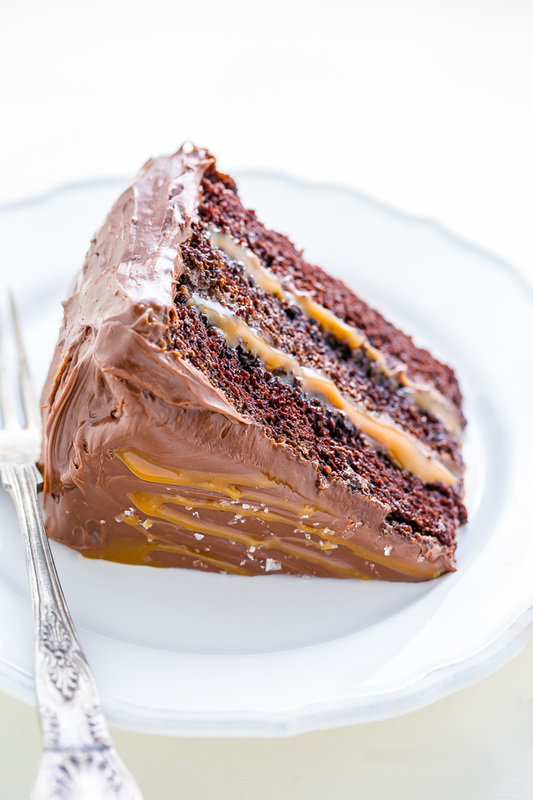 I used store bought salted caramel in this recipe to save me time, but feel free to use homemade if you’d like! 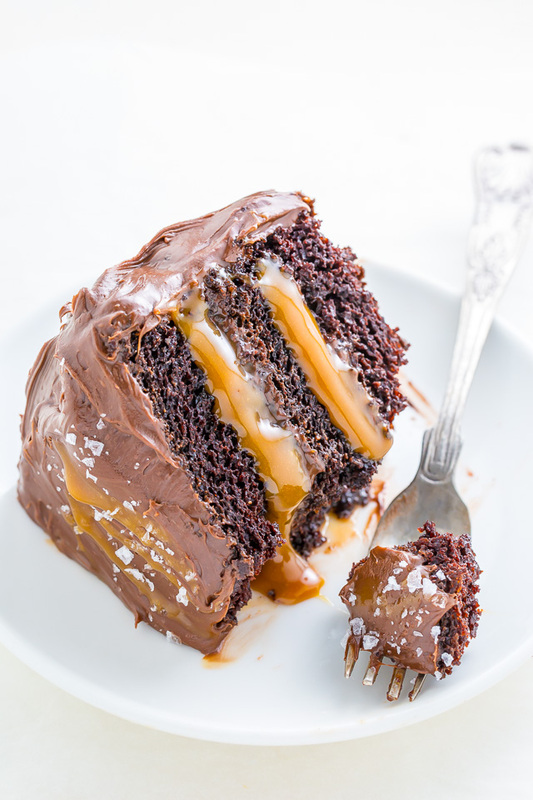 I suggest using a salted caramel sauce with a thicker consistency. You can click here to check out the exact caramel sauce I used. You might also want to check out my recipe for 6-minute salted caramel sauce. 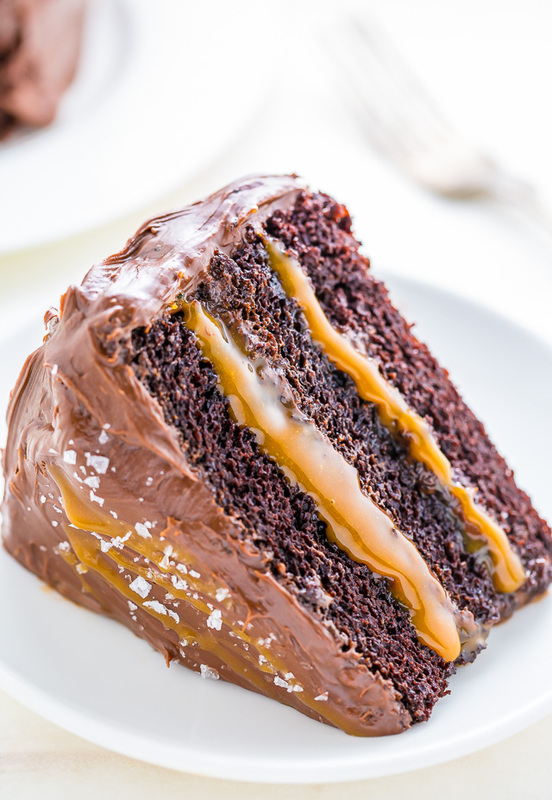 The cakes should be completely cool before adding the frosting and salted caramel. Can everyday be my birthday?! In the bowl of a stand mixer fitted with the paddle attachment, or in a large bowl using a handheld electric mixer, combine both sugars, flour, cocoa powder, baking soda, baking powder and salt; mix on low until dry ingredients are thoroughly combined. Use your hands to break up any large clumps, if needed. In a separate bowl combine the eggs, egg yolks, sour cream, milk, oil and vanilla extract; mix until completely combined. Pour mixture into the dry ingredients and beat on low until just incorporated. Pour in hot water and continue mixing until completely combined; about 1 minute. The batter will quite thin. In a stand mixer fitted with the paddle attachment, cream the softened butter on medium-speed until completely smooth; about 3 minutes. Turn the mixer off and sift the powdered sugar and cocoa into the mixing bowl. Turn the mixer on the lowest speed and mix until the sugar/cocoa have been absorbed by the butter; about 2 minutes. Increase mixer speed to medium; add in vanilla extract, salt, heavy cream and salted caramel; beat for 3 minutes. If your frosting appears a little too thin, add a little more confectioners' sugar; If your frosting needs to be thinner, add additional heavy cream, 1 tablespoon at a time.